We’ve been getting quite a bit of email wondering where we have been and why we haven’t chimed in on a number of large automotive issues. The short answer has been that It has been a busy summer over here. We provide content to a number of different publications, so quite simply put, it was the Four Wheel Drift that suffered. For all of you who were desperately waiting for our view on current events, here is a summary of where we stand on the issues. Cash For Clunkers: With our reputation for being involved with collector cars, people assumed we’d be absolutely against CFC. They were right, but not for the reasons they figured. The conventional wisdom circulating in the classic car and hot rod circuits is that CFC would cause the destruction of thousands of tomorrow’s classic cars…and therefore the program must be stopped at all costs. We take a different…more pragmatic view that exposes our business backgrounds. The crushed future classics affect from CFC will be far less noticeable than from rising scrap prices prior to WWII…or from the use of salt in a particularly bad winter in the Northeast and Midwest. In other words, most of the vehicles succumbing to the CFC crushers a) are mass-produced vehicles, b) are family cars, c) consequently are less likely to be restored in twenty to thirty years as collector vehicles. There are two big issues we do dislike about CFC. The first is that we’ve always felt that rebates simply create sales by cannibalizing future higher price/profit sales. Part of the decreased demand in 2007, 2008 and 2009 comes from the direct result of massive factory rebates in 2001, 2002 and 2003. Rebates are an ongoing nightmare for good product marketing folks who battle sales, finance and PR departments who are more focused on making numbers now so they can get their gold Rolexes from bonuses. Rebates kill the pipeline, dilute product value and image (although admittedly the CFC rebate doesn’t dilute product image like a standard manufacturer versions), and create a way for local dealers to provide vehicles at the same price as before the rebates, but without giving up any profit themselves. The second reason we dislike the CFC program is that unlike a standard manufacturer rebate program that puts the financial burden on the corporation, the CFC program puts it on taxpayers. And before you start writing the comment regarding that the program replaces the current fleet with more fuel-efficient vehicles, that’s a total red herring. This exact same thing would happen anyway – as the current fleet ages, it is replaced with newer vehicles – all which are more fuel efficient. The difference is cost. The artificial way costs taxpayers several billion, the other doesn’t. The bottom line is that the CFC program is nothing more than a boondoggle for auto manufacturers, dealers and scrap metal recyclers in a wrapper of good intentions paid for by taxpayer money. GM Selling Cars Via eBay: Here’s a whole lotta nothing. Simply an official program that mimics what hundreds of dealers have been doing with varying degrees of success for nearly a decade. It would have been a real story had GM found a loophole for the anti-trust laws prohibiting manufacturer-to-consumer sales to allow such sales using eBay as the “dealer”. New Hybrids: Yawn. Meet the new boss – same as the old boss. These are still uninspiring vehicles that struggle to get better mileage than the original Geo Metro despite delivering not much more in terms of performance, size, comfort, or enjoyment. Again people, hybrid technology is over a century old. Seller Beware: Autoweek reported in its current issue how people consigning their classics to Kruse have reported not receiving payment from the auction house for more than six months after their vehicles sold at auction. Even scarier for vehicle sellers – there is the Washington State court opinion at http://www.courts.wa.gov/opinions/index.cfm?fa=opinions.showOpinion&filename=614185MAJ , which results from the mess created when a car consignment operation (AGS Performance) closed prior to distributing the funds received from selling a Ferrari F355 on consignment. To complicate the matter, the selling party never provided the title for his Ferrari. The courts maintained that since AGS was in the business of selling cars, it didn’t need the title to facilitate a legal sale, leaving the buyer (Hensrude) with a legal purchase and the former owner (Sloss) with only the recourse of suing AGS for non-payment on a contract. The bottom line is that sellers of collector cars need to be very careful these days. Porsche Panamera: If we have to read another column in a major publication or hear another enthusiast question if the four-door Panamera is a “real Porsche”, we’re going to set ourselves on fire. It was a valid question when the 914…and maybe even somewhat valid when the 928 replaced the 911 as the “top-of-the-line” model in the late 1970s, but not anymore. Note to publications, enthusiasts and auto manufacturers: the Cayenne is the best-selling Porsche ever and no Porsche enthusiast or purist not wearing a tinfoil hat has ever cared about its affect on the brand, other than to thank it for providing the necessary cash flow to develop low-production high-performance cars like the Turbo, GT3, GT etc… More manufacturers need to ignore the purists, because if you cater to them, you get the GTO, Challenger, retro-Mustang, and new Camaro. Purists love these, but people with money don’t like them enough to buy them. It is with a heavy heart that this picture of Jesse’s fatal accident (by J. Lok /courtesy of The Seattle Times) is posted. I hope it reminds us all how dangerous cars are and helps us all to drive slower and safer. The automobile’s various roles in life are the topics of endless discussion here. Those of us who see vehicles as more than just a form of basic transport are never at a loss for words when describing how a specific car makes us feel. Monday morning I was quickly reminded how cars can indeed leave me speechless. I received a call from my brother informing me that a person I had known his whole life was dead. The bright, energetic, funny 23-year-old had been killed in a car accident. Jesse had been driving his Porsche Boxster when he somehow veered into a Ford Taurus head-on. Initial indications point that he might have been going too fast or he swerved and overcorrected to miss something. He crossed the center line and slammed into the larger Taurus. The picture shows the perfect angle the Taurus took up the side of the Porsche. Jesse was killed instantly. His passenger was rushed to the hospital with multiple injuries – but will recover. The driver of the Taurus was treated at the hospital with non-life-threatening injuries. Just ten weeks ago, Jesse had gone to work for my brother at his business strategy consultancy. One of my best friends, who also happens to work for my brother, said it best: “all 23-year-olds drive fast, at least those you want to be friends with.” We all did at that age, and many still do. Most of us felt entirely invincible behind the wheel of a car until we started wondering if we had attached the baby seat correctly for our first child. We might have escaped the probabilities, but they caught up with Jesse. The chances of a car-crazy guy in a fast car getting into a fatal accident are significantly higher than those of a minivan-driving forty-something mom. This doesn’t make it easier to swallow or accept. Jesse had car crazy DNA. His father met my father at the Northwest racetracks in the late 1950s. His father has owned a number of wonderful sports cars, and just recently competed in the Chihuahua Express Mexican vintage rally in a borrowed Jaguar E-Type. Just a week ago, Jesse’s oldest brother (around 20 years older), three nephews and I attended an Italian car show together. So, Jesse getting his hands on a Porsche Boxster didn’t seem strange at all, because passion for sports cars ran deep in the genetic code. Now every single time I see a glorious Boxster, I will be reminded of the tragic loss of a truly great individual. It won’t be the first time a car has been tied to horrible loss. The Mercedes 300SL still makes many think of the catastrophic accident killing drivers and spectators at the ’55 Le Mans. The Porsche 550 Spyder is synonymous with the loss of another young, handsome, promising gentleman: James Dean. It’s entirely different when it’s someone you know. I remember when Jesse was born. I videotaped his circumcision, for God’s sake! I used to get frustrated when at family events he’d keep crawling under the table. He grew up into an admirable young man – and the over-capacity crowd of friends and relatives at his funeral spoke to his affect on those that knew him. Most did not know he had served as a Big Brother for Big Brothers/Big Sisters of Puget Sound. Professionally, my brother (not known for heaping liberal amounts of praise on anyone) had been extremely impressed with Jesse’s analytical abilities ever since his first interview at the company. Life goes on for the rest of us. The chances that those of us who were car crazy before will swear off sports cars and unsafe classics are slim-to-none. We understand that while possible, Jesse’s accident resulted in a low probability worst-case scenario. Be this as it may it warrants a moment to stop and think. No matter how good we think we are behind the wheel, all cars – be it a Porsche, Volvo, Model A, Packard, Ferrari, or Honda require a healthy dose of attention and respect. 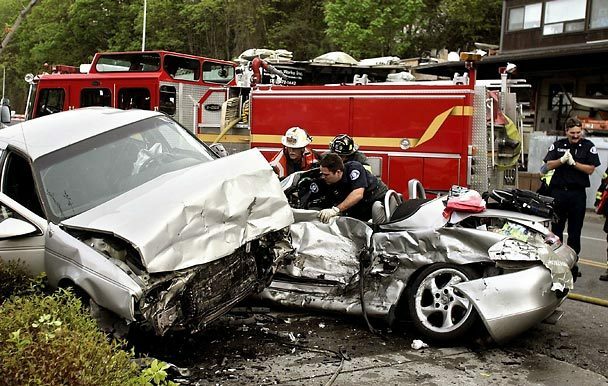 When we neglect attention or respect for even just the most fleeting moment, a car can bite back quickly, altering the course of lives forever.